Another holiday done, another on the way. 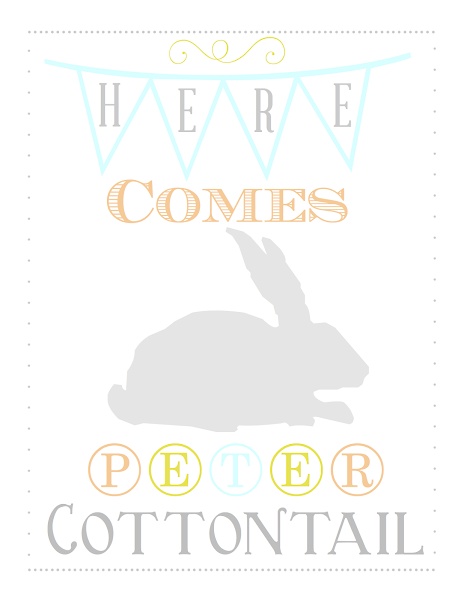 And what better way to welcome in the Easter season than with Peter Cottontail? Here's a bit of trivia for you. Do you know who Peter Cottontail is? I wasn't 100% sure. Thank goodness for Wikipedia! I had wondered if there was a connection between Peter Cottontail and Beatrix Potter's Peter Rabbit, but there isn't. The name comes from The Adventures of Peter Cottontail by Thornton Burgess. Looks like I have a bit of reading to catch up on. And if you like the song "Here Come Peter Cottontail" but can't remember anything past, "hoppin' down the bunny trail…." then click here for all the lyrics. I really do love the song! Wow! I had no idea a simple, fictional Easter character could require such research! But now we're all clear on who Peter Cottontail is.